Or view larger version. Mission San Carlos. Date unknown. Unknown artist. Hand-colored lithograph on paper. Collection of Oakland Museum of California. 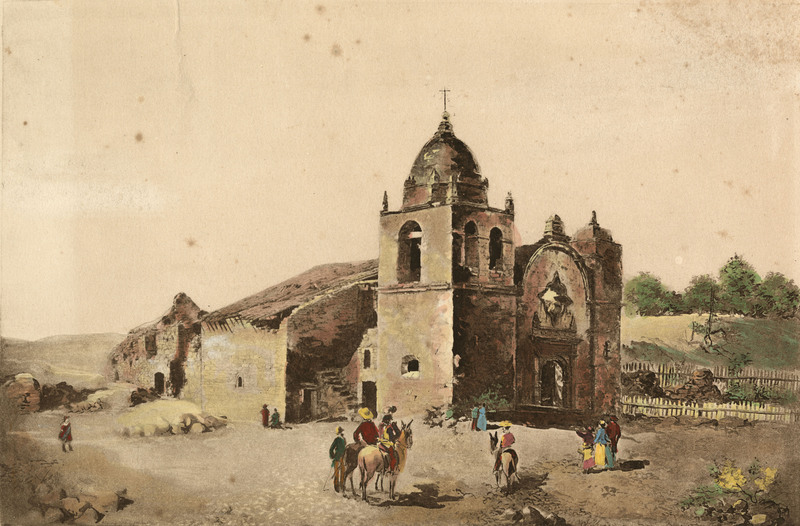 This is a hand colored lithograph of the Mission San Carlos Borroméo del río Carmelo. This mission is also known as the Carmel Mission. Founded in 1770, it was the headquarters of the Alta California mission chain and served as the residence Father Junipero Serra. The original mission was destroyed in the mid 19th century, and restored beginning in 1884. It remains a Roman Catholic parish church today.